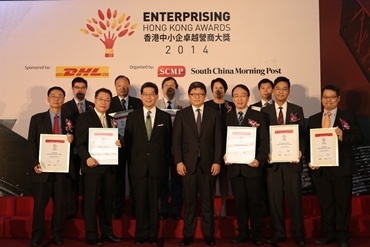 SCMP Group Ltd (SEHK: 583), Asia’s leading media holding company, today announced that the inaugural Enterprising Hong Kong Awards honoured eight outstanding small & medium enterprises (SMEs) and entrepreneurs in a presentation ceremony graced by HKSAR Government Secretary for Commerce & Economic Development Hon. Gregory So last night. and Mr. Sam Chan, 2014 National Business Director, Junior Chamber International Hong Kong. Young Entrepreneur Award – Mr. Alan Lim of E-Services Group Ltd.
CSR Award – Ultra Active Technology Ltd.
eBusiness Award – Drop-Shipping Global Services Ltd. Innovation Excellence Award – 4M Industrial Development Ltd. Export Excellence Award – Fu Hong Industries Ltd.
Achiever’s Award (Judges’ choice) – Mr. Stanley Wong of Chuan Chiong Co., Ltd.
Mr. Herman Lo of Fu Hong Industries; Mr. Girish Jhunjhnuwala, Ovolo Hotels; and Mr. Alan Lim of E-Services Group. 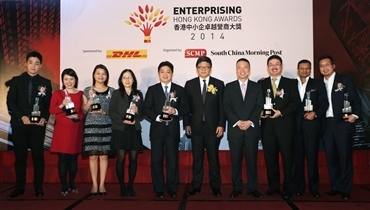 Enterprising Hong Kong Awards recognises and celebrates the SMEs and entrepreneurs whose brilliance in the business realm will serve as benchmarks for the industry and peers. The eight winners were nominated by a number of industry bodies and selected by a panel of judges comprised of respected businesspersons and industry stakeholders. Selection of the winners in Brand Excellence Award and Best Customer Service Award included panel judging as well as public voting.